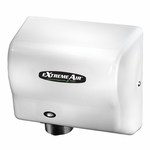 This Classic Series surface-mounted soap dispenser has a corrosion-resistant valve and dispenses commercially marketed all-purpose hand soaps. This unit is two-tone styling in black and grey, has a vandal-resistant lid with a unique keyless locking device. The lid of the dispenser pivots up after lock is disengaged for easy top filling. This unit has a large-capacity, translucent container that provides visible soap level.